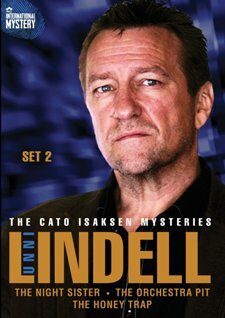 The Cato Isaksen Mysteries is like any other series. 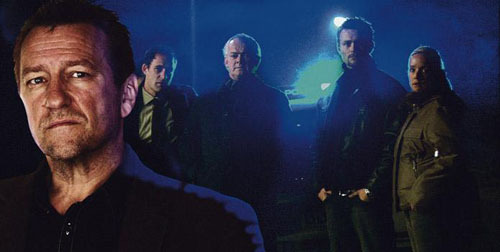 Each episode, or in this case each two-part made-for-TV movie, can be good or bad depending on plots, character development, acting, and production values. Of the six stories on DVD Sets One and Two, most are meh. All are based on the crime novels by the bestselling Norwegian author, Unni Lindell. The first movie, The Snake Bearer (Slangebæreren), opens with two youngsters peering through the mail slot of a door in their apartment building. What they see is a man lying on the floor. He’s dead. Stabbed twice, throat slit. Ooh. This is looking good. So far, so good in establishing the central character as a family man with a habit of leaving his women and children hanging when duty calls. Ditto for setting up the supporting characters of family members and work colleagues. The weaving in of more murders for the serial killer storyline, plus red herrings and the symbolism of the movie’s title — also fine. Certain plot devices, not so much, as they are a bit too convenient. And the ending: Rip. Off. Especially when the action leading up to the climax is heart-pounding stuff. The Dream Catcher (Drømmefangeren) follows the secret filming of (and voiceless phone calls to) three teen-aged female roommates in their flat, the investigation into the murder of one of them, and more Isaksen family issues, mostly with the eldest son. At first blush, this looks like a creepy thriller mystery. Alas, no, due mainly to two things: The convenience of many plot devices (again), and one character after another showing up as more caricature than fleshed-out personage, from the girl with an eating disorder and mean-girls type friends, to the religious zealot mother and wimpy father. Even the title’s symbolism turns out to be a “so what.” Ultimately the movie is disappointing and a near-waste of three hours. However, the conclusion of the sub-plot, in which Cato’s middle son is violently bullied, is maddening. In the name of all that is sacred in storytelling, how on earth is any viewer supposed to be satisfied with this resolution? I refrain from saying more about it, since doing so ventures into spoiler territory. Suffice it to say that it leaves a lot to be desired. So, Set One is, for the most part, a bust. What about Set Two? Read on. The Night Sister (Nattsøsteren) opens with a pagan ritual in the woods (complete with fiery pentagram, cloaked participants, and what looks to be a human sacrifice), then segues to the fatal shooting of a frightened elderly woman on a quiet, residential street. Another ooh start. Looking good. The initial hook to keep watching is in wondering how the two events are linked. Even after the connection is revealed, there is enough intrigue to maintain interest. And to a lesser degree, the question of whether Cato and the forensic pathologist will get busy, as they clearly have the hots for each other, is another hmm. But the sub-plot of the missing Marmalade is so very weak. And missing altogether are any references to Cato’s ex-girlfriend, their second child, and his eldest son. The action, well, it plods along, similar to the progress the detectives make (or don’t make, as it were) in their murder and missing person investigations. When things do pick up pace and get exciting, they finish with a “Where did that come from?” cop-out conclusion. Argh! The best movie of the lot is The Orchestra Pit (Orkestergraven), which focuses first on the stabbing, throat-slitting murder of a divorced, tiger-mother of a violinist, and later the abduction of Cato’s toddler son (the first one with his ex-gf). The storyline is intricate, a sub-plot that seems incidental at first turns out to be critical, the action moves along at a nice clip, and the ending is one you don’t see coming. (Well, mostly, since there is a big clue in a particular something that is noticeable by its absence. But still.) A full thumbs up for this one. Lastly, there is The Honey Trap (Honningfellen). This movie, whose storylines follow the intentional and fatal hit-and-run of a young Lithuanian woman and the disappearance of a small boy, has everything going for it until one instance of sheer carelessness after another erodes the storytelling. One: A couple of scenes (really the dialogue in them) come off as wholly unbelievable. Two: Certain characters simply vanish from the story, with no tying up of the loose ends related to them. Three: There is no hint anywhere in the story as to why one important character does what it does. Four: This one is the kicker. The killer’s identity is implied, not explicit. Depending on one’s interpretation, the culprit could be someone else. There you have it. Unni Lindell is neither a brilliant nor awful series. It has its moments, and can be quite compelling at times, but it fails in too many areas to be a must-watch. In addition to the weaknesses within the crime stories, the supporting characters are one-dimensional, and the gradual reduction of time spent on Cato’s family life devolves the series into a run-of-the-mill cop show.